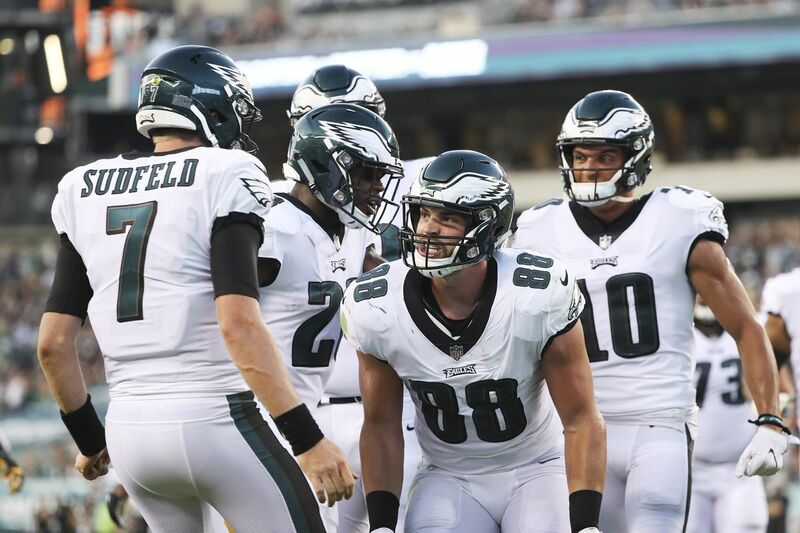 Eagles tight end Dallas Goedert celebrates his second-quarter touchdown reception with quarterback Nate Sudfeld. ATLANTIC CITY — Exhibition football didn't move the needle much at the four Atlantic City sportsbooks on Thursday, but there was some action. "The first week of preseason is like an appetizer, you're not going to see people invest a lot of money," said Bill Sattler, the director of specialty games for Caesars Entertainment, the parent company of Bally's and Harrah's in A.C.
"Eagles fans are rabid, but they're also smart," said Sattler. "We saw more parlay action than straight bets." The Eagles were -3 against the Steelers. Parlays pay heavier odds and require multiple correct picks. Harrah's was quiet an hour before kickoff as customer Tony Hernandez went through his picks. "Why do I need to go to Vegas?" the Winona, N.J., resident asked rhetorically. "I can put a parlay in and go to the pool. I don't need to spend hours at the [card] tables. I can get the same rush [betting sports]." The Borgata is still a horse-racing parlor first, sportsbook second. There was a rush of bettors right as the game was starting. But there was also a shouting match between a couple of 60-year-olds, perhaps sparked by the 50-1 horse fouling up everybody's trifecta in the 10th at Gulfstream. The Eagles-Steelers game wasn't on any of the TVs at kickoff. Bruce Deifik, owner of the Ocean Resort, was proudly talking about the ongoing construction of his sportsbook, which he says will be completed in two weeks. The temporary station with four windows will be increased to 11. A few dozen people ringed the sportsbar at Ocean Resort and a mild cheer went up late in the first half when Pittsburgh's Chris Boswell kicked an extra point to put the Steelers up 22-14. They were celebrating hitting the game's over/under, which the sportsbook here had at 35. Nice when you hit a full-game bet by halftime. Ten minutes later, a customer asked the book's manager for the Eagles-Steelers second-half line. Yeah, football betting is here. Things will get crazier when the games actually count.